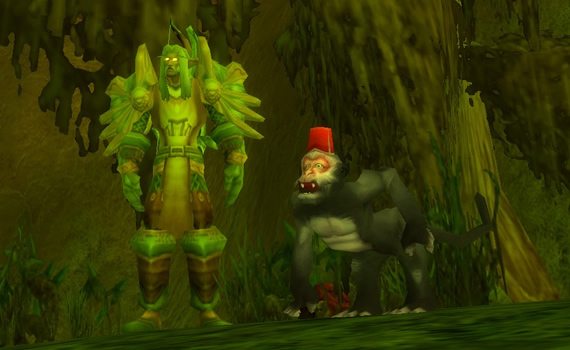 Among the 37 new pet looks added in Patch 5.1, 8 of them are unique-rare ghostly models. Where can you find these phantom beasties, you ask..? Undead country, of course. Who can resist taming a monkey wearing a Fez..? Not I.
Gib can be found lurking in the wilds within the Swamp of Sorrows. To my knowledge, he has only one place where he likes to hang out, which is in a small little alcove at the western edge of the zone (coordinates: 17,47). Patch notes for the first major content patch for MoP (Patch 5.1) were posted earlier today. Lynx Rush will now function as a bleed effect which will cause damage every 3 seconds, for a period of 15 seconds – stacking up to 9 times. I’m guessing it’s also now a single-target attack..? I’m a bit unclear on that one. Bestial Wrath will no longer render your pet immune from all crowd control, but it will still break crowd control when activated. This means it’s going to be really important you have good hotkeys for Master’s Call and Bullheaded – mainly for PvP. Of course, none of this is set in stone, as always with the PTR. Any or all of these could change prior to 5.1 going live, but this is a quick rundown of what could possibly be in store for the Hunter class when 5.1 hits.